The yellower and more leathery the skin of the mummified Lenin grows, and the higher the statistically determined number of visitors to the Lenin Mausoleum climbs, the less are people concerned about the real Lenin and his historical significance. More and more monuments are erected to his memory, more and more motion pictures turned out in which he is the central figure more and more books written about him, and the Russian confectioners mould sweetmeats in forms which bear his features. And yet the fadedness of the faces on the chocolate Lenins is matched by the unclarity and the improbability of the stories which are told about him. Though the Lenin Institute in Moscow may publish his collected works, they no longer have any meaning beside, the fantastic legends which have formed around his name. As soon as people began to concern themselves with Lenin's collar-buttons, they also ceased to bother about his ideas. Everyone then fashions his own Lenin, and if not after his own image, at any rate after his own desires. What the Napoleonic legend is to France and the legend of Fredricus Rex to Germany, the Lenin legend is to the new Russia. Just as people once absolutely refused to believe in the death of Napoleon, and just as they hoped for the resurrection of Fredricus Rex, so in Russia still today there are peasants to whom the new 'little father Czar' has not died but continues to indulge his insatiable appetite in demanding from them ever fresh tribute. Others light eternal lamps under the picture of Lenin: to them he is a saint, a redeemer to whom one prays for aid. Millions of eyes stare at millions of these pictures, and see in Lenin the Russian Moses, St. George, Ulysses, Hercules, God or Devil. The Lenin cult has become a new religion before which even the atheistic communists gladly bend the knee: it makes life easier in every respect. Lenin appears to them as the father of the Soviet Republic, the man who made victory possible for the revolution, the great leader without whom they themselves would not exist. But not only in Russia and not only in popular legend, but also to a large part of the Marxist intelligentsia throughout the world, the Russian Revolution has become a world event so closely bound up with the genius of Lenin that one gets the impression that without him that revolution and hence also world history might possibly have taken an essentially different course. A truly objective analysis of the Russian Revolution, however, will at once reveal the untenability of such an idea. "The assertion that history is made by great men is from a theoretical standpoint wholly unfounded. " Such are the words in which Lenin himself turns on the legend which insists on making him alone responsible for the 'success' or the 'crime' of the Russian Revolution. He considered the world war determining as regards the direct cause of its outbreak and for the time of its occurrence. Yes; without the war, he says, "the revolution would possibly have been postponed for decades longer. " The idea that the outbreak and the course of the Russian Revolution depended in very large measure on Lenin necessarily implies a complete identification of the revolution with the taking over of power by the Bolsheviks. Trotsky has made a remark to the effect that the entire credit for the success of the October uprising belongs to Lenin; against the opposition of almost all his party friends, the resolution for insurrection was carried by him alone. But the seizure of power by the Bolsheviks did not give to the revolution the spirit of Lenin; on the contrary, Lenin had so completely adapted himself to the necessities of the revolution that practically he fulfilled the task of that class which he ostensibly combated. Of course it is often asserted that with the taking over of state power by the Bolsheviks the originally bourgeois-democratic revolution was forthwith converted into the socialist-proletarian one. But is it really possible for anyone seriously to believe that a single political act is capable of taking the place of a whole historical development; that seven months - from February to October - sufficed to form the economic presuppositions of a socialist revolution in a country which was just engaged in getting rid of its feudal and absolutistic fetters, in order to give freer play to the forces of modern capitalism? Up until the Revolution, and in very large measure even yet today, the decisive role in the economic and social development of Russia was played by the agrarian question. Of the 174 million inhabitants prior to the war, only 24 million lived in cities. In each thousand of the gainfully employed, 719 were engaged in agriculture. In spite of their enormous economic importance, the majority of the peasants still led a wretched existence. The cause of their deplorable situation was the insufficiency of soil. State, nobility and large landed proprietors assured to themselves with Asiatic brutality an unconscionable exploitation of the population. Since the abolition of serfdom (1861) the scarcity of land for the peasant masses had constantly been the question around which all others revolved in Russian domestic politics. It formed the main object of all reform endeavours, which saw in it the driving power of the approaching revolution, which had to be turned aside. The financial policy of the czarist regime, with its ever new levies of indirect taxes, worsened the situation of the peasants still more. The expenditures for the army, the fleet, the state apparatus attained gigantic proportions the greater part of the State budget went for unproductive purposes, which totally ruined the economic foundation of agriculture. 'Freedom and Land' was thus the necessary revolutionary demand of the peasants. Under this watchword occurred a series of peasant uprisings which soon, in the period from 1902 to 1906, assumed significant scope. In combination with the mass strike movements of the workers taking place at the same time, they produced such a violent commotion in the heart of Czarism that that period may in truth be denoted as a 'dress rehearsal' for the revolution of 1917. The way in which Czarism reacted to these rebellions is best illustrated by the expression of the then vice-governor of Tambiovsk, Bogdanovitch: "Few arrested, the more shot. " And one of the officers who had taken part in the suppression of the insurrections wrote: "All around us, bloodshed; everything going up in flames; we shoot, strike down, stab. " It was in this sea of blood and flames that the revolution of 1917 was born. Lenin and the Bolsheviks did not invent the winning slogan 'Land to the Peasants'; rather, they accepted the real peasant revolution going on independently of them. Taking advantage of the vacillating attitude of the Kerensky regime, which still hoped to be able to settle the agrarian question by way of peaceful discussion; the Bolsheviks won the goodwill of the peasants and were thus enabled to drive the Kerensky government out and take over the power themselves. But this was possible for them only as agents of the peasants' will, by sanctioning their appropriation of land, and it was only through their support that the Bolsheviks were able to maintain themselves in power. The slogan 'Land to the Peasants' has nothing to do with communist principles. The cutting up of the large estates into a great number of small independent farming enterprises was a measure directly opposed to socialism, and which could be justified only on the ground of tactical necessity. The subsequent changes in the peasant policy of Lenin and the Bolsheviks were powerless to effect any change in the necessary consequences of this original opportunistic policy. In spite of all the collectivising, which up to now is largely limited to the technical side of the productive process, Russian agriculture is still today basically determined by private economic interests and motives. And this involves the impossibility, in the industrial field as well, of arriving at more than a state-capitalist economy. Even though this state capitalism alms at transforming the farming population completely into exploitable agricultural wage workers, this goal is not at all likely to be attained in view of the new revolutionary encounters bound up with such a venture. The present collectivising cannot be regarded as the fulfilment of socialism. This becomes clear when one considers that observers of the Russian scene such as Maurice Hindus hold it possible that "even if the Soviets were to collapse, Russian agriculture would remain collectivised, with control more perhaps in the hands of the peasants than of the government. " However, even if the Bolshevik agricultural policy were to lead to the desired end, even a state capitalism extending to all branches of national economy, the situation of the workers would still remain unchanged. Nor could such a consummation be regarded as a transition to real socialism, since those elements of the population now privileged by the state capitalism would defend their privileges against all changes in exactly the same way as did the private owners previously at the time of the 1917 revolution. The industrial workers still formed a very small minority of the population, and were accordingly unable to impress upon the Russian Revolution a character in keeping with their own needs. The bourgeois elements which likewise were combating Czarism soon recoiled before the nature of their own tasks. They could not accede to the revolutionary solution of the agrarian question, since a general expropriation of land might all too easily bring in its train the expropriation of industry. Neither the peasants nor the workers followed them, and the fate of the bourgeoisie was decided by the temporary alliance between these latter groups. It was not the bourgeoisie but the workers who brought the bourgeois revolution to its conclusion; the place of the capitalists was taken over by the Bolshevik state apparatus under the Leninist slogan: 'If capitalism anyhow, then let's make it.' Of course the workers in the cities had overthrown capitalism, but only in order now to convert the Bolshevik party apparatus into their new masters. In the industrial cities the workers' struggle went on under socialist demands, seemingly independent of the peasant revolution under way at the same time and yet in a decisive sense determined by this latter. The original revolutionary demands of the workers were objectively incapable of being carried through. To be sure, the workers were able, with the aid of the peasants, to win the state power for their party, but this new State soon took a position directly opposed to the workers' interests. An opposition which even today has assumed forms which actually make it possible to speak of a 'Red Czarism': suppression of strikes, deportations, mass executions, and hence also the coming to life of new illegal organisations which are conducting a communist revolt against the present bogus socialism. The talk just now about an extension of democracy in Russia, the thought of introducing a sort of parliamentarianism, the resolution at the last soviet congress about dismantling the dictatorship, all this is merely a tactical manoeuvre designed to compensate for the government's latest acts of violence against the opposition. These promises are not to be taken seriously, but are an outgrowth of the Leninist practice, which was always well calculated to work both ways at the same time in the interest of its own stability and security. The zigzag course of the Leninist policy springs from the necessity of conforming constantly to the shiftings of class forces in Russia in such manner that the government may always remain master of the situation. And so there is accepted today what was rejected the day before, or vice versa; unprincipledness has been elevated into a principle, and the Leninist party is concerned with only one thing, namely, the exercise of state power at any price. At this place, however, we are interested only in making clear that the Russian Revolution was not dependent on Lenin or on the Bolsheviks, but that the decisive element in it was the revolt of the peasants. And, for that matter, Zinoviev, still in power at the time and on Lenin's side, had stated as late as the 11th Bolshevik Party Congress (March-April 1921): "It was not the proletarian vanguard on our side, but the coming over to us of the army, because we demanded peace, which was the decisive factor in our victory. The army, however consisted of peasants. If we had not been supported by the millions of peasant soldiers, our victory over the bourgeoisie would have been out of the question. " The great interest of the peasants in the matter of land, the slight interest with reference to the question of government, enabled the Bolsheviks to conduct a victorious struggle for the government. The peasants were quite willing to leave the Kremlin to the Bolsheviks, provided only that they themselves were not interfered with in their own struggle against the large estate owners. But even in the cities, Lenin was not the decisive factor in the conflicts between capital and labour. On the contrary, he was helplessly drawn along in the wake of the workers, who in their demands and actual measures went far beyond the Bolsheviks. It was not Lenin who conducted the revolution, but the revolution conducted him. Though as late as the October uprising Lenin restricted his earlier and more thorough-going demands to that of control of production, and wished to stop short with the socialisation of the banks and transportation facilities, without the general abolition of private ownership, the workers paid no further attention to his views and expropriated all enterprises. It is interesting to recall that the first decree of the Bolshevik government was directed against the wild, unauthorised expropriations of factories through the workers' councils. But these soviets were still stronger than the party apparatus) and they compelled Lenin to issue the decree for the nationalisation of all industrial enterprises. It was only under the pressure brought to bear by the workers that the Bolsheviks consented to this change in their own plans. Gradually, through the extension of state power, the influence of the soviets became weakened, until today they no longer serve more than decorative purposes. During the first years of the revolution, up to the introduction of the New Economic Policy (1921), there was actually of course some experimentation in Russia in the communist sense. This is not, however, to be set down to the account of Lenin, but of those forces which made of him a political chameleon who at one time assumed a reactionary and at another a revolutionary colour. New peasant uprisings against the Bolsheviks first drive Lenin to a more radical policy, a stronger emphasis upon the interests of the workers and the poor peasants who had come off short-handed in connection with the first distribution of land. But then this policy proves a failure, since the poor peasants whose interests are thus preferred refuse to support the Bolsheviks and Lenin 'turns the face again to the middle peasants'. In such a case Lenin has no scruples about strengthening the private-capitalist elements anew, and the earlier allies, who have now grown uncomfortable, are shot down with cannon, as was the case in Kronstadt. No one, however, has yet suspected the Fabians of containing a world-revolutionary force. And Lenin is of course first of all acclaimed as a world revolutionary, notwithstanding the fact that the present Russian government by which his 'estate' is administered issues emphatic denial when the press publishes reports of Russian toasts to the world revolution. The legend of the world-revolutionary significance of Lenin receives its nourishment from his consistent international position during the world war. It was quite impossible for Lenin at that time to conceive that a Russian revolution would have no further repercussions and be abandoned to itself. There were two reasons for this view: first, because such a thought was in contradiction with the objective situation resulting from the world war; and secondly, he assumed that the onslaught of the imperialist nations against the Bolsheviks would break the back of the Russian Revolution if the proletariat of Western Europe failed to come the rescue. Lenin's call for the world revolution was primarily a call for support and maintenance of Bolshevik power. The proof that it was not much more than this is furnished by his inconstancy in this question: in addition to making his demands for world revolution, he at the same time came out for the 'right of self-determination of all oppressed peoples', for their national liberation. Yet this double-entry bookkeeping sprang likewise from the Jacobinical need of the Bolsheviks to hold on to power. With both slogans the forces of intervention of the capitalist countries in Russian affairs were weakened, since their attention was thus diverted to their own territories and colonies. That meant a respite for the Bolsheviks. In order to make it as long as possible, Lenin established his International. It set for itself a double task: on the one hand, to subordinate the workers of Western Europe and America to the will of Moscow; on the other, to strengthen the influence of Moscow upon the peoples of Eastern Asia. Work on the international field was modelled after the course of the Russian Revolution. The goal was that of combining the interests of the workers and peasants on a worldwide scale and control of them through the Bolsheviks, by means of the Communist International. In this way at least the Bolshevist state power in Russia received support; and in case the world revolution should really spread, the power over the world was to be won. Though the first design was attended with success, at the same time the second was not accomplished. The world revolution was unable to make headway as an enlarged imitation of the Russian, and the national limitations of the victory in Russia necessarily made of the Bolsheviks a counter-revolutionary force on the international plane. Hence also the demand for the 'world revolution' was converted into the 'theory of the building of socialism in one country'. And this is not a perversion of the Leninist standpoint - as Trotsky, for example, asserts today -but the direct consequence of the pseudo world-revolutionary policy pursued by Lenin himself. It was clear at that time, even to many Bolsheviks, that the restriction of the revolution to Russia would make of the Russian Revolution itself a factor by which the world revolution would he impeded. Thus, for example, Eugene Varga wrote in his book 'Economic Problems of the Proletarian Dictatorship', published by the Communist International (1921): "The danger exists that Russia may be cut out as the motive power of the international revolution ... There are Communists in Russia who have grown tired of waiting for the European revolution and wish to make the best of their national isolation... . With a Russia which would regard the social revolution of the other countries as a matter with which it had no concern, the capitalist countries would at any rate be able to live in peaceful neighbourliness. I am far from believing that such a bottling up of revolutionary Russia would be able to stop the progress of the world revolution. But that progress would be slowed down. " And with the sharpening domestic crises in Russia around that time, it was not long before almost all communists, including Varga himself, had the feeling of which Varga here complains. In fact, still earlier, even in 1920, Lenin and Trotsky took pains to stem the revolutionary forces of Europe. Peace throughout the world was required in order to assure the building of state capitalism in Russia under the auspices of the Bolsheviks. It was inadvisable to have this peace disturbed either by way of war or new revolutions, for in either case a country like Russia was sure to be drawn in. Accordingly, Lenin imposed, through splitting and intrigue, a neo-reformist course upon the labour movement of Western Europe, a course which led to its total dissolution. It was with sharp words indeed that Trotsky, with the approval of Lenin, turned on the uprising in Central Germany (1921): "We must flatly say to the German workers that we regard this philosophy of the offensive as the greatest danger and in its practical application as the greatest political crime. " And in another revolutionary situation, in 1923, Trotsky declared to the correspondent of the Manchester Guardian, again with the approval of Lenin: "We are of course interested in the victory of the working classes, but it is not at all to our interest to have the revolution break out in a Europe which is bled and exhausted and to have the proletariat receive from the hands of the bourgeoisie nothing but ruins. We are interested in the maintenance of peace. " And ten years later, when Hitler seized power, the Communist International did not move a finger to prevent him. Trotsky is not only in error, but reveals a failure of memory resulting no doubt from the loss of his uniform, when today he characterises Stalin's failure to help the German communists as a betrayal of the principles of Leninism. This betrayal was constantly practised by Lenin, and by Trotsky himself. But according to a dictum of Trotsky's, the important thing is of course not what is done, but who does it. Stalin is, as a matter of fact, the best disciple of Lenin, in so far as concerns his attitude to German fascism. The Bolsheviks have also of course not refrained from entering into alliances with Turkey and lending political and economic support to the government of that country even at a time when the sharpest measures were being taken there against the communists - measures which frequently eclipsed even the actions of a Hitler. In view of the fact that the Communist International in so far as it continues to function is merely an agency for the Russian tourist trade, in view of the collapse in all countries of the communist movements controlled from Moscow, the legend of Lenin the world-revolutionist, is no doubt sufficiently weakened that one may count on its disappearance in the near future. And of course even today the hangers-on of the Communist International are no longer operating with the concept of the world revolution, but speak of the 'Workers Fatherland' from which they draw their enthusiasm so long as they are not forced to live in it as workers. Those who continue to acclaim Lenin as the world revolutionary par excellence are as a matter of fact getting excited about nothing more than Lenin's political dreams of worldwide power, dreams which faded to nothingness in the light of day. The contradiction existing between the real historical significance of Lenin and that which is generally ascribed to him is greater and at the same time more inscrutable than in the case of any other personage acting on modern history. We have shown that he can not be made responsible for the success of the Russian Revolution, and also that his theory and practice can not, as is so often done; be appraised as of world-revolutionary importance. Neither, in spite of all assertions to the contrary, can he be regarded as having extended or supplemented Marxism. In the work of Thomas B. Brameld entitled 'A Philosophical Approach to Communism', recently published by the University of Chicago, communism is still defined as "a synthesis of the doctrines of Marx, Engels and Lenin. " It is not only in this book, but also generally, and quite particularly in the party-communist press, that Lenin is placed in such a relation to Marx and Engels. Stalin has denoted Leninism as 'Marxism in the period of imperialism'. Such a position, however, derives its only justification from an unfounded overestimation of Lenin. Lenin has not added to Marxism a single element which could be rated as new and independent. Lenin's philosophical outlook is dialectical materialism as developed by Marx, Engels and Plekhanov. It is to it that he refers in connection with all important problems: it is his criterion in everything and the final court of appeal. In his main philosophical work, 'Materialism and Empiro­criticism', he merely repeats Engels in tracing the oppositions of the different philosophical points of view hack to the one great contradiction: Materialism vs. Idealism. While for the first position, Nature is primary and Mind secondary; exactly the opposite holds of the other. This previously known formulation is documented by Lenin with additional material from the various fields of knowledge. And so there can be no thought of any essential enrichment of the Marxian dialectic on the part of Lenin. In the field of philosophy, to speak of a Leninist school is impossible. In the field of economic theory, also, no such independent significance can be ascribed to Lenin. Lenin's economic writings are more Marxist than those of any of his contemporaries, but they are only brilliant applications of the already existing economic doctrines associated with Marxism. Lenin had absolutely no thought of being an independent theoretician in matters of economics; to him, Marx had already said everything fundamental in this field. Since, to his mind, it was quite impossible to go beyond Marx, he concerned himself with nothing further than proving that the Marxist postulates were in accord with the actual development. His principal work on economics, 'The Development of Capitalism in Russia', is eloquent testimony on this point. Lenin never wanted to be more than Marx's disciple, and so it is only in legend that one can speak of a theory of 'Leninism'. 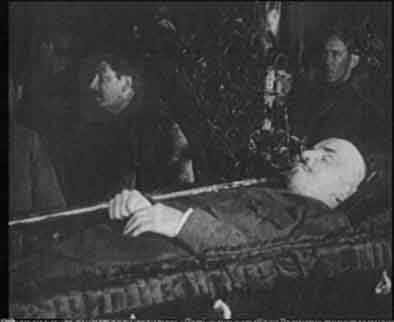 Lenin wanted above all else to be a practical politician. His theoretical works are almost exclusively of a polemic nature. They combat the theoretical and other enemies of Marxism, which Lenin identifies with his own political strivings and those of the Bolsheviks generally. To Marxism, practice decides regarding the truth of a theory. As a practician endeavouring to actualise the doctrines of Marx, Lenin may have actually rendered Marxism an enormous service. However, as regards Marxism again, every practice is a social one, which can be modified and influenced by individuals only in very limited measure, never decisively. There is no doubt that the union of theory and practice, of final goal and concrete questions of the moment, with which Lenin was constantly concerned, may be acclaimed as a great accomplishment. But the criterion for this accomplishment is again the success which attends it, and that success, as we have already said, was denied to Lenin. His work not only failed to advance the world revolutionary movement; it also failed to form the preconditions for a truly socialist society in Russia. The success (such as it was) did not bring him nearer to his goal, but pushed it father into the distance. The actual conditions in Russia and the present situation of the workers throughout the world ought really to be sufficient proof to any communist observer that the present 'Leninist' policy is just the opposite of that expressed by its phraseology. And in the long run such a condition must without doubt destroy the artificially constructed Lenin Legend, so that history itself will finally set Lenin in his proper historical place. And Lenin is terribly silent, terribly silent and dead. It is interesting to recall that the first decree of the Bolshevik government was directed against the wild, unauthorised expropriations of factories through the workers' councils. Interesting, is there a time line of Bolshevik decrees online anywhere? It would help clear up a lot of confusion out there. According to Goodey, Limon takes over from Pankratova 'the wrong title and the wrong date and adds his own embellishments'. He truncates a quotation in the text and changes the authorship of the original document, attributing it to the 'non-Bolshevik leaders of the All-Russian Council of Factory Committees'. On all these scores, Goodey is wrong. Limon did not get his facts via Pankratova. The 'secret' can now be let out of the bag. Limon got his facts from someone who had seen the document at first hand, and before Pankratova had even thought of writing about it. I have also seen this original source. Even Goodey could have had access to it, had he been less concerned in proving the bad faith of those he disagrees with politically, and had he chosen to check with Limon. (Limon is, after all, on the Editorial Board of Autogestion, for which paper Goodey is the 'correspondent for Great Britain'). The 'original' source is Chapter 8 Les Soviets d'Usine a I'oeuvre') of Max Hoschiller's book Le Mirage Sovietique (Payot, Paris, 1921). Hoschiller was a French revolutionary who spoke Russian well. The authenticity of his account is vouched for by no less a figure than Andre Merrheim who wrote the Preface to Hoschiller's book. It was in fact at Merrheim's suggestion that Hoschiller went to Russia. Now what does Hoschiller say a) as to the authorship, b) as to the title, and c) as to the content of the controversial document? Hoschiller makes it clear that in the weeks preceding the revolution it was the anarchists who were striking the tune ('donnaientle la') in the Factory Committees and that the Bolsheviks could only trail along after them Cetaient bien obliges de marcher a leur remorque'). On December 7, 1917, the decree setting up the Vesenkha (Supreme Economic Council) was promulgated. The Vesenkha comprised some members of the All-Russian Council of Workers Control (a very indirect sop to the Factory Committees), massive representation of all the new Commissariats and a number of experts, nominated from above, in a consultative capacity. According to Hoschiller the leaders of the Factory Committees, dissatisfied with Lenin's concessions ('mecontents en depit de toutes les concessions du chef du gouvernement') did not implement the decisions but elaborated their own decree in the form of a Practical Manual for the Implementation of Workers Control ('elaborerent leur propre decret sous forme d'un Manuel Pratique pour I' Execution du Controle ouvrier'). Hoschiller describes how jealously he had kept the eight great in-folio sheets, printed in double columns, that had been widely distributed in the streets of Petrograd. He has clearly seen the original, which is more than can be said with any confidence of Lozovski, Pankratova . . . or even of Goodey. But my French isn't good enough to verify any of the above. The Pankratova was reproduced here in English but they've skipped the section with the quote we're interested in. So grabbing the Pankratova text in full and/or translating the Hoschiller section would be worth doing.